Economists had been expecting today's second quarter GDP estimate to rise from initial readings, based largely on auto sales and housing, and they were correct. "The GDP estimate released today is based on more complete source data than were available for the 'advance' estimate issued last month. In the advance estimate, the increase in real GDP was 2.3 percent. With the second estimate for the second quarter, nonresidential fixed investment and private inventory investment increased. With the advance estimate, both of these components were estimated to have slightly decreased." GDP was a bit higher than the Bloomberg Economic Consensus. I do not believe today's report will impact estimates for third quarter for the Atlanta Fed GDPNow Model by much if any. We will find out on the next update, tomorrow. 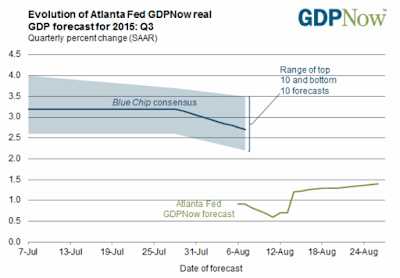 The GDPNow forecast for third quarter is 1.4%. Through three quarters, annualized growth is about 1.57%, not exactly rate hike material. Growth is fueled by autos and housing, the only two strong aspects of this economy. Last year, the third quarter was strong, this year will not repeat.